Did another illustration for Streeter's blog of one of his Extremely Brilliant Ideas. "Who hates change? Not the kind that got Obama elected, the kind that jingles around in your pocket. You know, filthy, metal money. I hate change in my regular life but I really hate it when I fly. I have to take it out, put it in the bin, send it through the xray machine and finally scrape it all back up and return it to my pocket, where it will stay until it falls out in my seat. Wouldn’t it be nice if you could just ditch the change before you got through security? Well how about this? We install little Ronald McDonald House-style donation bins to the xray machine table. 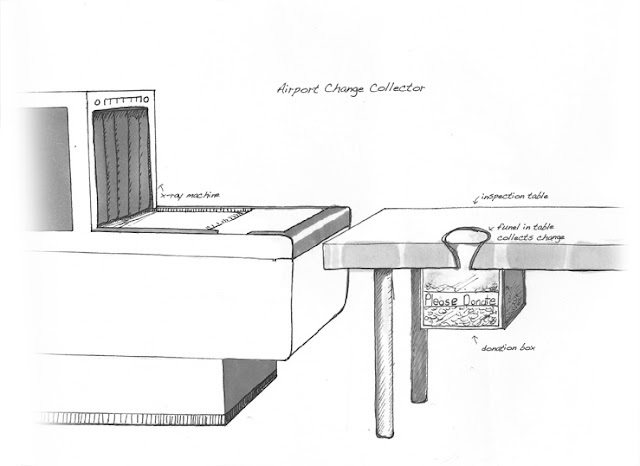 Dump your change in before you go through the metal detector and never see it again! “But I can just leave the change in the bin,” you retort. True, but as the DailyWhat informed us, the TSA just steals your change if you do that. And I have no interest in helping the TSA any more than my taxes already do. So why not this? I bet we could collect a few million dollars in the first few months. Maybe more. And it would all go to…I don’t know. The Red Cross, maybe? We’ll figure that out later. The important thing is that we’d have a way to get rid of loose change, help some to-be-determined people and cut off the TSA’s free-money faucet. You may take our dignity, TSA, but you will never take our quarters!"